Encouraging the user to enter a value in an optional field? This is a follow-up question from the previous question Case-study for hiding the optional fields? Literally including the phrase “optional” after a label is much clearer than any visual symbol you could use to mean the same thing. Someone may always wonder 'what does this asterisk mean?' and have to go hunting for a legend that explains things. I have removed the Indicator for the Required Fields and replaced it by adding and Indicator for the Optional Fields instead, since there were only one visible optional field in the initial page. The optional fields has a business value so it cannot be removed, but I still hide it because "shorter forms are completed more often than longer forms" as pointed by @JohnGB from his previous answer. I changed my approach from hiding the optional fields. Now I hide the whole section of the Emergency Contact Information. I also change the label for showing the optional field as I want to fully secure my claims and fill-up the optional fields. 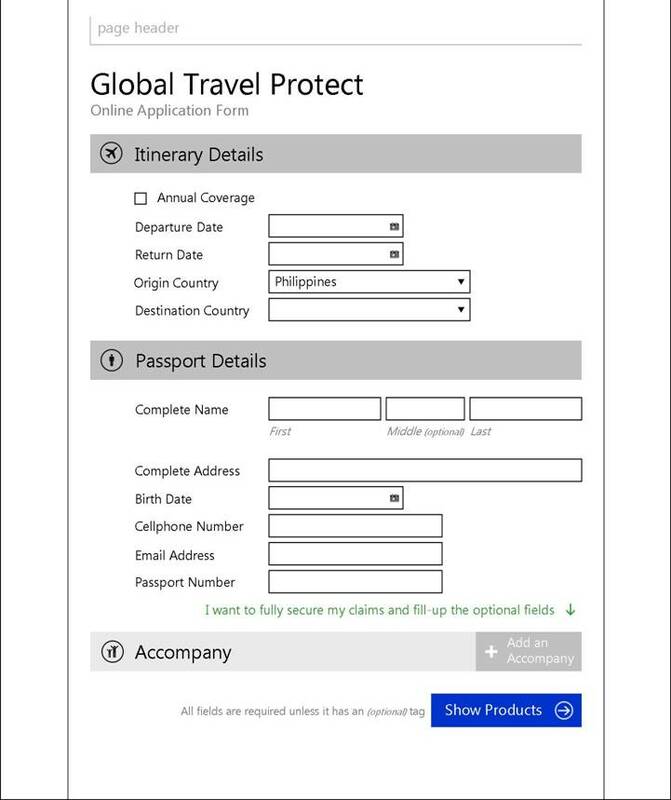 This directly tell the user that the optional fields is for an optional feature (which is an additional security for their claims) as pointed by @Andy from his (or her?) previous answer, which might also encourage the user to actually enter values to those optional fields. From UX perspective, is this a good way to encourage the user to enter a value in the optional fields? Are there any UX study (or standards) about encouraging the user to enter a value in the optional fields? Where it is not possible to remove an optional field, you must explain why the information is being collected and the situations under which it will be used. This will help users understand the value obtained from their effort and will encourage completion of these optional fields. Having done loads of user research in the field of personal insurance, I can tell you that many people believe insurance companies will do anything they can to avoid paying a claim. Given this common pre-conception, I think using words like "to fully secure my claims" is dangerous. I can see some form fillers wondering what this means: "Will my claims not be processed if I don't fill out this information?" or "Are they just saying that to frighten me into providing more information?" If there is a genuine business need, then I suggest you be transparent about it. For instance, as JohnGB said, knowing that providing the information will speed up processing is a genuine incentive, so worth mentioning. If, alternatively, you use one of passport expiry and gender to help with identification, then say that. If the "business value" is just marketing, then you should be open about this too. Similarly, if your business will use the emergency contact information to get in touch if the customer is unable to, then say that. This is personal, highly-sensitive and detailed information you're asking for, so if you want people to give it to you, you need to earn their trust and have them judge doing so as worthwhile. You need to apply some information architecture here to structure these fields into a comprehensive way. 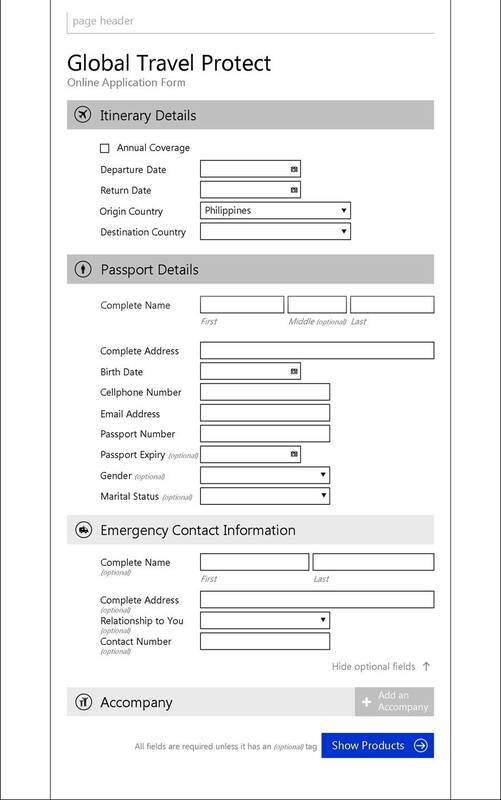 This is a good place to use the DRY(don't repeat yourself) principle, for the emergency contact info section, if the entire section comprised of optional fields, then that section is in fact an optional section. Then you can label at once, why the user would want to provide these optional data. 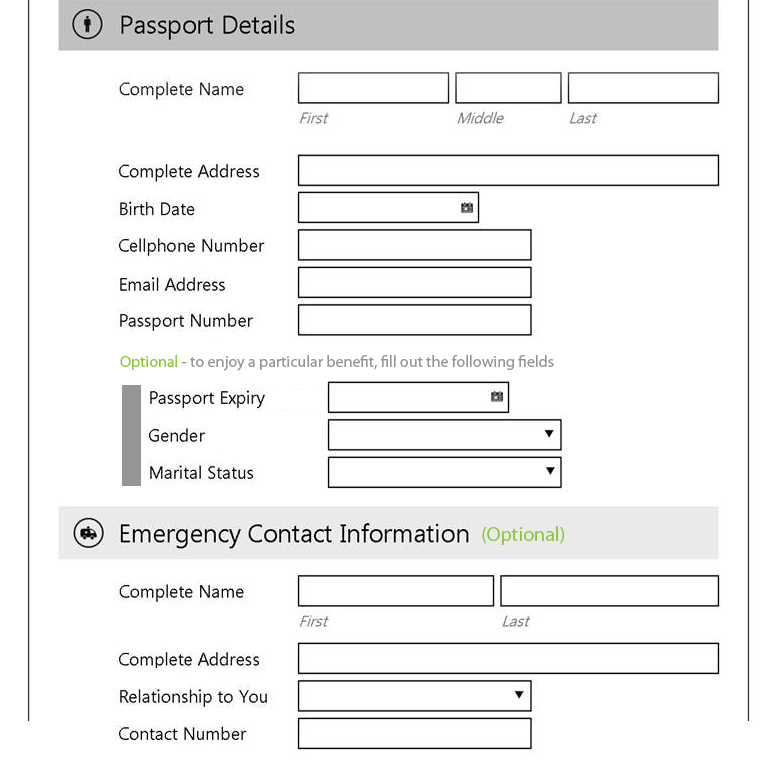 You need to tell people why they would like to fill out the passport expiry, gender and marital status. Is it for 3 different benefits, or they are for the same benefit? If for the same benefit I suggest you contain these 3 fields in a sub-section and label it optional as well as a reason you collecting them. As an exception, middle name is always implied to be "if applied" kind of field. So you don't have to label it as optional. And optional is not even the right word, because it's not my option to give you my middle name or not, since some people don't have middle names, so it's not as simple as just an option. If you can't offer a real benefit (and communicate it), then I would recommend creating a benefit of some sort to encourage them to enter the optional fields. Your first image states that "I want to fully secure my claims and fill up the optional fields", which is a good start, but I don' understand what exactly you mean by "fully secure". If it's an insurance claim form, then what most customers care about is the time to process it. If the additional information is used in the processing, then it is true and useful to state something like: "To help your claim be processed as fast as possible, please fill out these optional fields". You need to find a way to align your desires and those of your customers, and then use language to frame them in a way that makes them want to fill out the forms. Don't make false claims though. Ever. I would be inclined to do the opposite of what you are doing: show the optional fields, and offer a link to "skip emergency contact for now" When they click it, hide the fields, but explain the consequences of doing so. Offer to let them "do it now" and restore the fields. If you are going to let them skip it for now, indicate that they can fill it in later. Once they are signed up, display an warning/exclamation sign next to their name, and when linking to their profile summary, highlight any incomplete fields. Showing a profile completion percentage is a good way to encourage users to finish a profile. The way you are putting it up right now, "to fully secure.." is intimidating to the user. Your language currently gives an impression that the user is not secure at the moment and might lead to panic on the user's end. Hence, I believe is not the right way to approach it. You can have a field indicator right above the optional section. A field indicator is something like, when you create an account with gmail/outlook/yahoo etc. they show you how strong your password is. So based on the field data above, show them a similar benefit bar (or a how secure are you bar but that might be a tad bit difficult to interpret as well as calculate). It is eye-catching. Such a bar always tends to catch the user's eye and since it is about benefit, they would definitely pay attention. Now you have their attention in a positive way, without adding much story you have shown that they are not reaping the full benefits. You can drop in a line under the benefit bar which says "Make most out of your blah blah" something. This is encouraging for the users to click on the optional section and open it (because now they can relate the term "benefit" directly with it). You have their attention now, for each of the sections then you can explain the benefits for each of the fields there as FID above suggested. Not the answer you're looking for? Browse other questions tagged website-design forms usability user-behavior progressive-disclosure or ask your own question. What's the best and most intuitive way to have a user enter a height value in feet and inches into a web form? Name and Company - One field or Two? How to make users leave out optional fields when they don't have anything interesting to fill in?